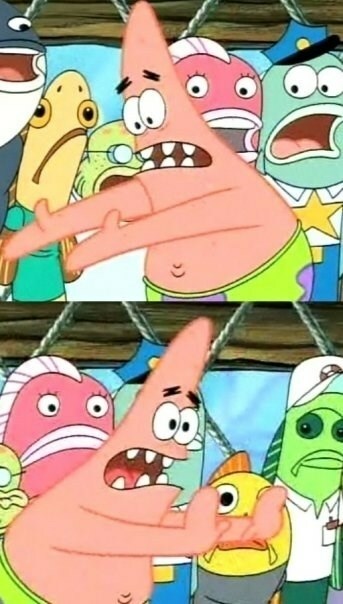 Moving on to less obvious memes, we have Push it Somewhere Else Patrick, which takes a little bit of explanation for those who have not encountered it before. This meme is based on a snippet of an episode of the popular children’s television cartoon, SpongeBob Squarepants. The episode is entitled “Squid on Strike and Sandy, SpongeBob, and the Worm”. During the episode, the starfish character makes a now infamous pushing gesture, and the line he speaks has formed the basis for the text of different sayings that have been invented to go along with the graphic. The format of the text follows what is said in the cartoon, with a formula of “We Should X, and – and Y”. It can also be done as “We Should X and Y (name of location)”. The original statement by the starfish is: “We should take Bikini Bottom and push it somewhere else”. Patrick is a very expressive starfish, and the cartoon in its entirety has become a frequent part of popular culture. It is no surprise that it has formed the basis of a popular meme. Variations of the meme include “We should take Facebook – and push it somewhere else”, and “Let’s take this thread – and bump it to the front page”.